After being drafted #7 overall in 2007 and traded for CC Sabathia this week, here's a look back at Matt LaPorta's final three seasons at UF. Former UF slugger Matt LaPorta and three other Milwaukee Brewers’ minor league players were traded to the Cleveland Indians organization for reigning Cy Young Award Winner CC Sabathia on Monday. At Double-A Huntsville, LaPorta was hitting .288 with a .402 OBP and a .978 OPS, including 20 homers and 66 RBIs in 302 at-bats. LaPorta attended Charlotte High School in his hometown after transferring from Port Charlotte High. He played quarterback on his freshman football team for the Pirates. He was drafted by the Chicago Cubs in the 14th round of the 2003 amateur baseball draft but chose to play at the University of Florida, where he was chosen as a First-Team Freshman All-American by Baseball America in 2004. 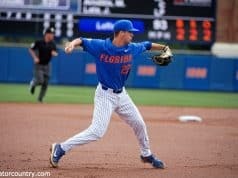 He had a breakthrough season his sophomore year, garnering All-American honors as he helped lead the Gators to the 2005 College World Series final. His 26 home runs led the NCAA and set a UF record, breaking Brad Wilkerson’s mark. Following the CWS, LaPorta was of the 2005 USA Baseball National Team. Both LaPorta and the team struggled in 2006, as his batting average dipped from .328 to .259 due to an oblique injury, but he was was drafted in the 14th round of the 2006 Major League Baseball Draft by the Boston Red Sox. 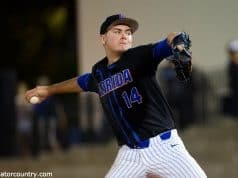 He chose to stay at Florida for his senior year, which paid off when he earned his second All-American nod despite the team’s continued struggles. 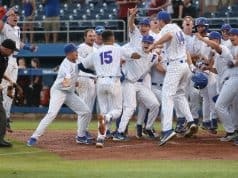 LaPorta batted .402 with 20 home runs his senior season with the Gators to become the first two-time SEC Player of the Year despite suffering a leg injury midway through the season. UF’s all-time leader with 74 home runs, a total that rates third on the SEC’s career list, LaPorta is first in times hit by a pitch (51), second in RBI (206), third in slugging percentage (.681), fourth in walks (140), fifth in runs (197) and tied for ninth in on-base percentage (.459). LaPorta was drafted by the Milwaukee Brewers with the 7th overall pick of the 2007 First Year Player Draft, receiving a signing bonus of about $2 million. In his first professional at bat, LaPorta hit a home run off of former UF teammate Bryan Augenstein while playing for the Helena Brewers. LaPorta finished the 2007 season with the West Virginia Power, hitting 10 home runs in 23 games during the regular season. LaPorta was selected by the Brewers to represent them in the Arizona Fall League. He impressed many people playing with the Mesa Solar Sox while playing in 30 games and had 6 home runs, which was tied for the most in the league. In January, the Brewers announced that LaPorta would be invited to spring training. On the opening day game for the Huntsville Stars, LaPorta hit a grand slam. LaPorta reported to the Double-A Akron Aeros following Monday’s trade.